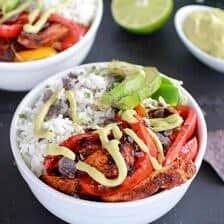 Fiesta Chicken + Cilantro Lime Rice Fajita Bowl with Avocado Chipotle Crema. I know it’s only Thursday, but is it fiesta time yet? 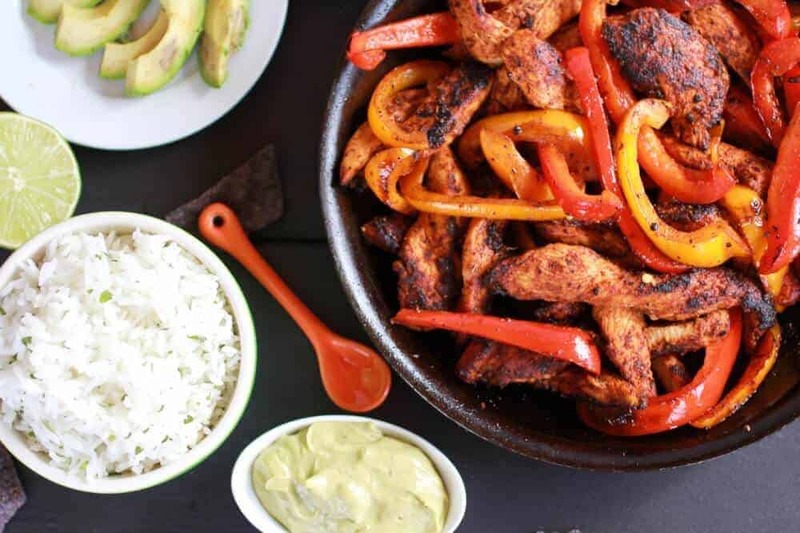 I’m pretty sure that with this fajita bowl it can be fiesta time, well…anytime. Seriously though, this is one of those things you could eat everyday and not get tired of. Oh, and the avocado crema I could eat that with a spoon. I am all about the crema. Yesterday I day-dreamed about hitting up LA (LA without the traffic would be the bomb!) and today we are going to Mexico. Really it was like a Mexican fiesta took over my kitchen. It was awesome. All I needed was some of these margaritas (Jessica, seriously these look awesome) and those cute little umbrellas that they put in drinks. I even loved these when I was little – I used to beg my mom to buy them. Does anyone else LOVE those umbrellas? When I was twelve I made my mom find them online and buy them in bulk (I think there were like a hundred in the package) for my birthday party. I used to love to put them in my lemonade (um truthfully, if I had them I totally still would). Oh, and those cool straw hats that I think they wear down in Mexico. I say think because I have never actually been to Mexico. Unless, you count my little fiesta I had in my kitchen the other day. You know what’s really cool about cooking? How you can experience so many different cultures through food. Some of my favorites are Thai, Chinese and Indian. But I really had fun with these Fajita Bowls. I am pretty sure, no I am sure, it was because Mexico sounds awesome right about now. Sun, beach, mariachi bands and of the 8o degrees (um, I see a theme here). 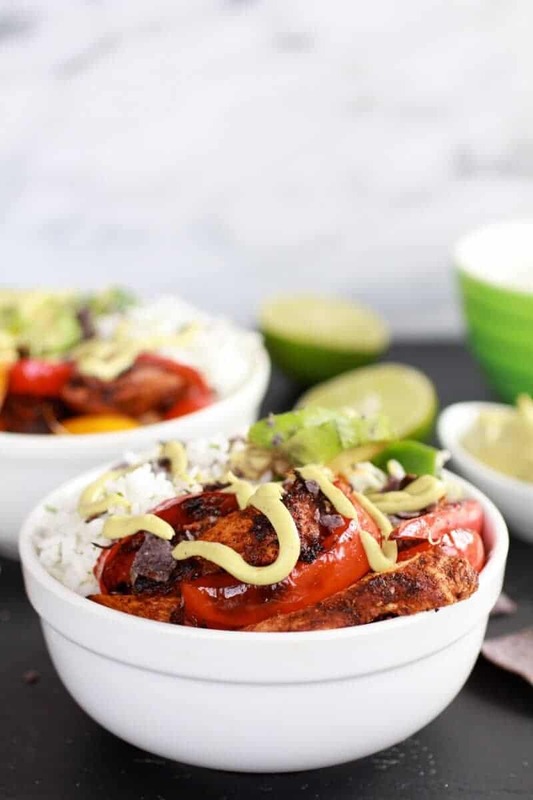 Plus, red peppers and chipotle and limes and avocados and rice make me all happy inside (that was not intended to be a run-on sentence, but I just couldn’t stop, too much awesomeness going on in this bowl). Ok, don’t make fun of me but I totally had Kenny Chesney’s “Beer In Mexico” and “When the Sun Goes Down” both on repeat. For like three hours. Three awesome hours in Mexico…. 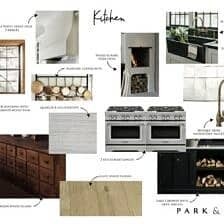 I mean my kitchen. Please tell me you guys do this too? You blast your country music while you’re knee-deep in chicken, avocado and rice? And please don’t tell me you don’t like country music. I mean they sing about beaches and sun or how awesome Nashville is. Oh, fudge I asked for it. You can make fun of me now. Anyway, I say Thursday is the perfect day for a mini fiesta. We need something to get us through until Friday, right? 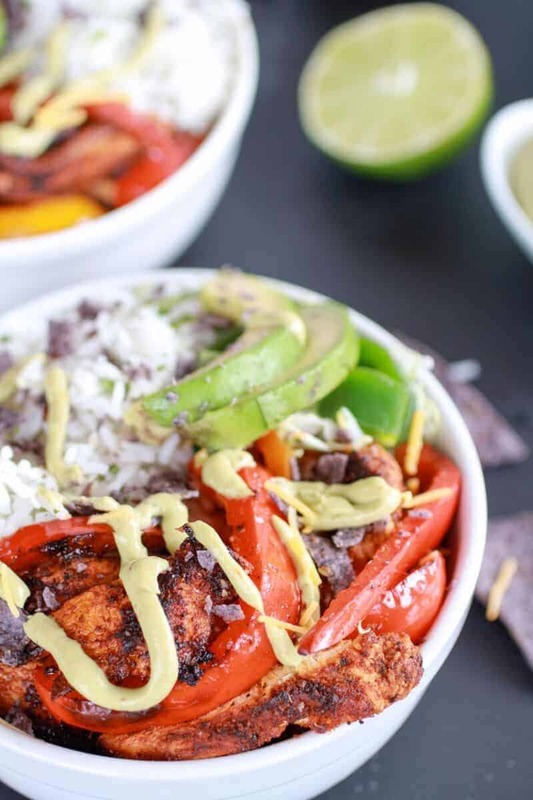 The best part is that these bowl are pretty quick and it is possible you have most of the ingredients in your fridge right now. 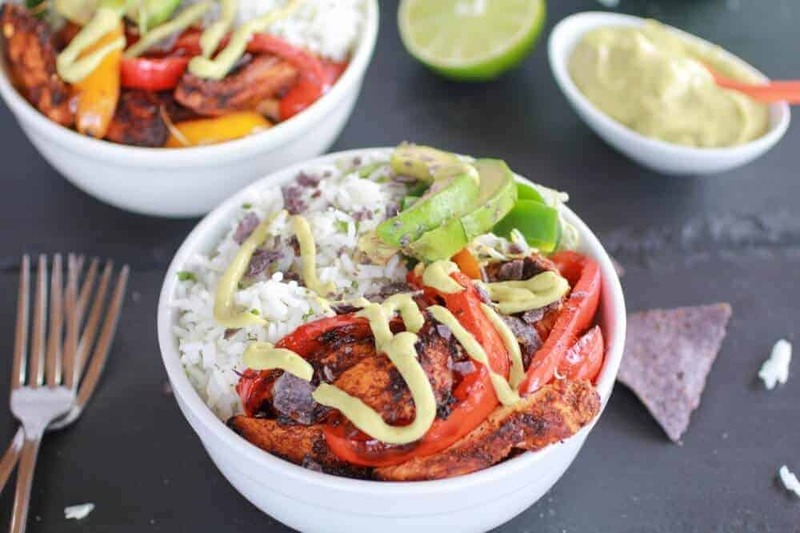 Chicken, avocados, bell peppers, rice, limes and chipotle are always in our house. ALWAYS. It’s a bad day if we run out. Bad. The flavors are insane. There is so many and they are so good together. And then there’s all the different textures. There’s crunch from the veggies and then the rice is soft and the crema is so smooth. Soo good. All this fiesta talk is making me want to relive this whole bowl again. Music and all. Don’t let the long recipe scare you off. It is mostly just the spice mix for the chicken. If you want to take a short cut you could buy a pre-made fajita spice mix. If you can though, make your own, it is so much butter. The best part is that these bowl are pretty quick and it is possible you have most of the ingredients in your fridge right now. Cook the rice according to package directions. When the rice is done cooking, toss in the chopped cilantro and lime juice. Set aside and keep warm. In a medium size bowl combine the chipotle chili powder, cumin, brown sugar, paprika, onion powder, garlic powder, chili powder, salt and pepper. Add the olive oil and lime juice and whisk together with a fork. Toss with the chicken strips. Set aside while you make the crema. 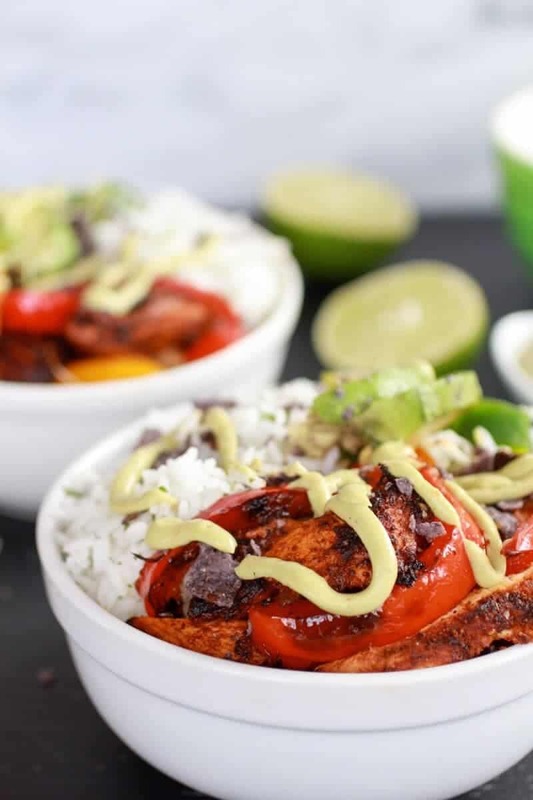 In a food processor or blender combine the greek yogurt, avocado, garlic, lime juice, adobo sauce, honey, crushed red pepper and salt. Puree until smooth. Add a tablespoon or two of water if it is a a little thick. Taste and add more salt if desired. Set a side. Heat a large pan or wok until fairly hot. Arrange the chicken (marinade and all) in the pan and cook on high heat until the chicken are golden brown and the chicken begins to caramelize. Turn the chicken on the other side and let them cooked until the other side is just cooked through. Then add the sliced peppers and saute on high heat for about 3 minutes or until slighty soft. 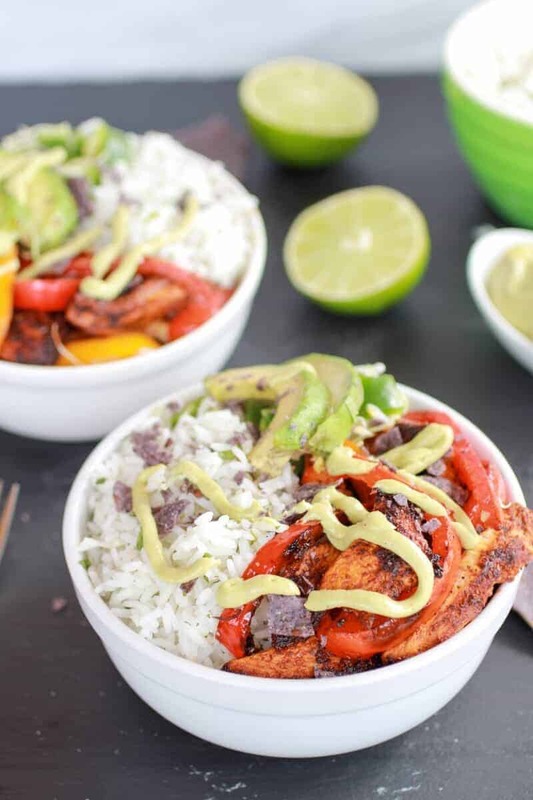 To serve: In a medium sized bowl, add rice and topped with chicken fajitas and lettuce. 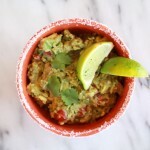 Add a little cheese to each bowl and then drizzle with the avocado chipotle crema. Top with crushed tortilla chips if desired. So, are you ready for a fiesta? 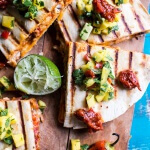 Fiesta Chicken Quesadillas with Chipotle Relish and Mango Salsa. 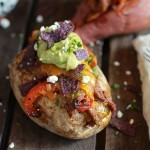 20 recipes for cinco de mayo. 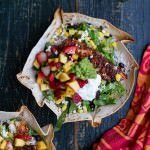 Chipotle Mahi Mahi Burrito Bowls w/ Coconut Lime Rice + Strawberry-Mango Salsa. Oh my goodness! That looks so amazing! Mmmmm…this looks wonderful!! Great idea. all of my favorite things in one bowl, you say? perfect! Wow! these sounds so good and looks delicious. How can you go wrong with Mexican? I think I am going to have to steal the chipotle crema recipe. I have leftover adobo and this will be perfect. Thanks for sharing in FFF. This looks so good that it may be what we have for dinner tonight! Thanks for sharing! My mouth is watering so much right now, this looks amazing! 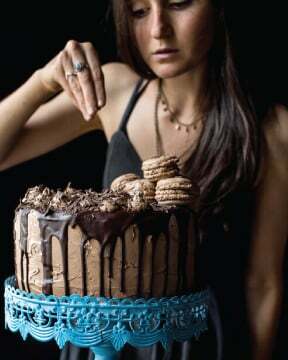 I’m going to make this SOON. My family loves Mexican! 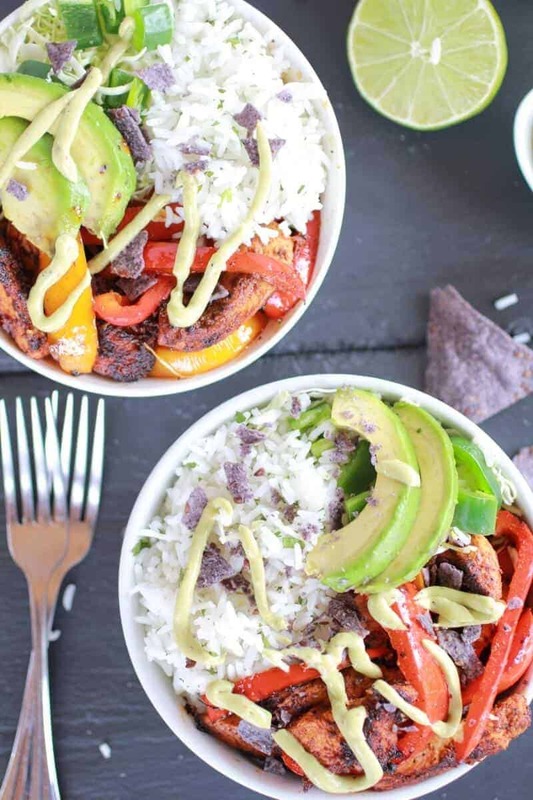 This totally looks like a fiesta in a bowl! Yum-o! Thanks for sharing at Show Me Your Plaid Monday’s! Oh my goodness! This looks so good! 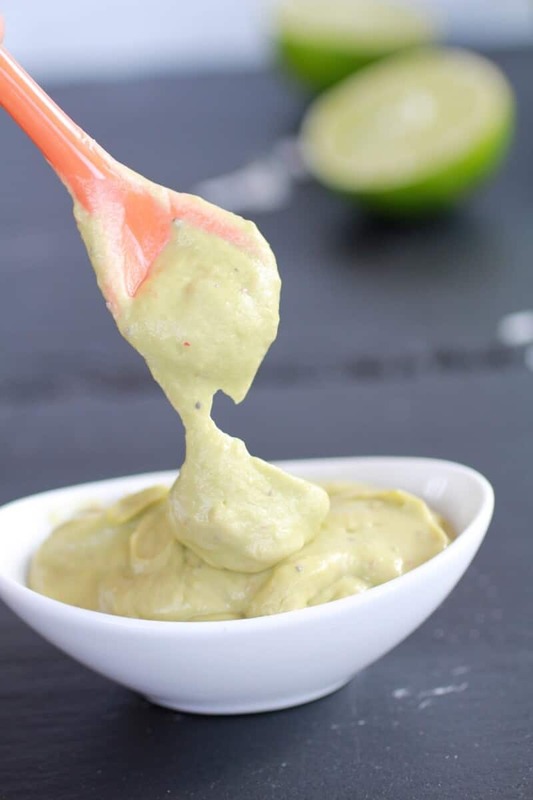 Love the idea of the avocado cream, definitely going to try this out on my next mexican dish. Thanks for the post! Totally pinning these to my Recipes to Try board! Looks wonderful!!! Stopping by from Tasty Thursdays, this looks delicious! Thanks, this one is good! 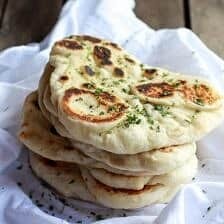 Delicious, family loved it and will make this again! 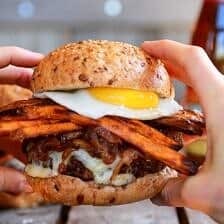 Wishing I had this on the menu for tonight! That looks amazing! Great pictures. This right here is my love language. 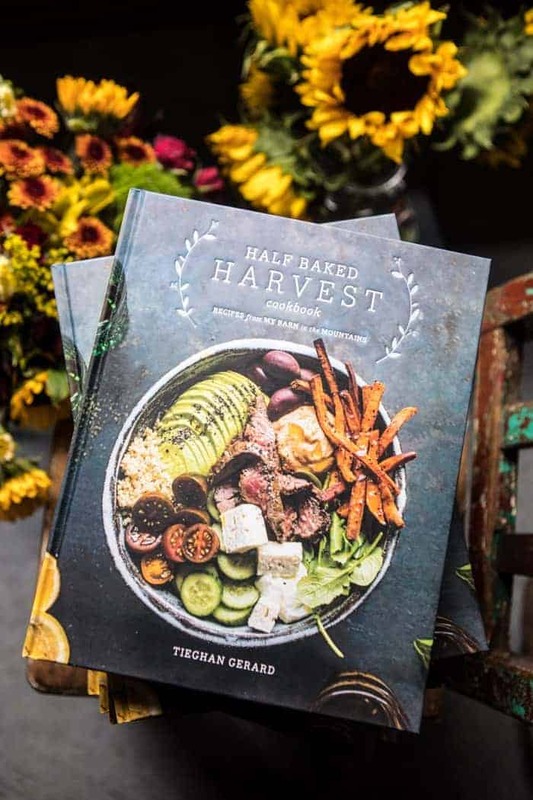 You are chock full of good looking recipes. Time to do some bookmarking and recipe saving. Can’t believe I’m just now visiting this space. Better late than never! Thank you Melissa!! You have no idea how excited I am that you found my site!! Seriously! Tieghan- I stumbled on your blog a few days ago and it’s already taken over my kitchen. I made the buffalo chicken quinoa last week and it might be my favorite thing I’ve ever made! 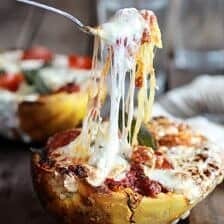 I made these bowls tonight (literally just finished eating a few minutes ago) and they were absolutely delicious- my husband is currently sneaking thirds in the kitchen and thinks I can’t hear :). The crema is almost identical to something I make to top fish tacos (except I add cilantro to the mix). Thanks so much for all your wonderful recipes and I can’t wait to try more! Oh my goodness!! This makes me SO happy! Thank you!! Hope everything you try you love! !